An anode ray (also positive ray or canal ray) is a beam of positive ions that is created by certain types of gas discharge tubes. 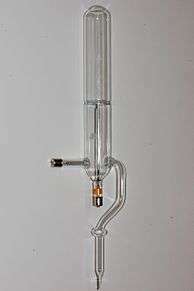 They were first observed in Crookes tubes during experiments by the German scientist Eugen Goldstein, in 1886. Later work on anode rays by Wilhelm Wien and J. J. Thomson led to the development of mass spectrometry. 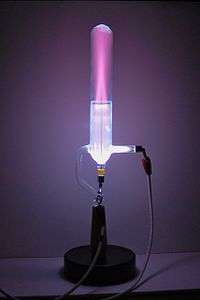 Goldstein used a gas discharge tube which had a perforated cathode. When a high electrical potential of several thousand volts is applied between the cathode and anode, faint luminous "rays" are seen extending from the holes in the back of the cathode. These rays are beams of particles moving in a direction opposite to the "cathode rays," which are streams of electrons which move toward the anode. Goldstein called these positive rays Kanalstrahlen, "channel rays" or "canal rays", because they were produced by the holes or channels in the cathode. In 1907 a study of how this "ray" was deflected in a magnetic field, revealed that the particles making up the ray were not all the same mass. The lightest ones, formed when there was some hydrogen gas in the tube, were calculated to be about 1840 times as massive as an electron. They were protons. The process by which anode rays are formed in a gas discharge anode ray tube is as follows. When the high voltage is applied to the tube, its electric field accelerates the small number of ions (electrically charged atoms) always present in the gas, created by natural processes such as radioactivity. These collide with atoms of the gas, knocking electrons off of them and creating more positive ions. These ions and electrons in turn strike more atoms, creating more positive ions in a chain reaction. The positive ions are all attracted to the negative cathode, and some pass through the holes in the cathode. These are the anode rays. An anode ray ion source typically is an anode coated with the halide salt of an alkali or alkaline earth metal. Application of a sufficiently high electrical potential creates alkali or alkaline earth ions and their emission is most brightly visible at the anode. ↑ Grayson, Michael A. (2002). Measuring mass: from positive rays to proteins. Philadelphia: Chemical Heritage Press. p. 4. ISBN 0-941901-31-9. ↑ Thomson, J. J. (1921). Rays of positive electricity, and their application to chemical analyses (1921). p. 142. Retrieved 2013-04-22. ↑ Kenneth Tompkins Bainbridge; Alfred Otto Nier (1950). Relative Isotopic Abundances of the Elements. National Academies. pp. 2–. NAP:16632. Retrieved 21 April 2013.